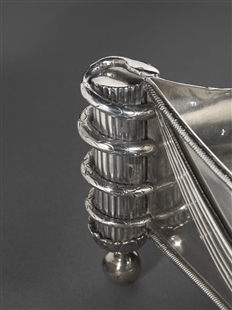 Before the Speaker calls each session of the House to order, this coin-silver inkstand is placed on the rostrum. 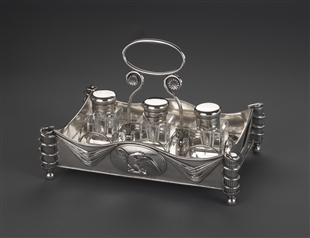 The inkstand is considered the oldest surviving artifact of the House and was made between 1810 and 1820. Although its origins are mysterious, it most likely came into the House around 1819. 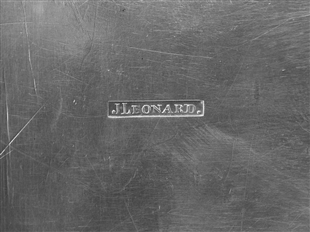 The inkstand is stamped with the mark of J. Leonard, a Washington silversmith and watchmaker. 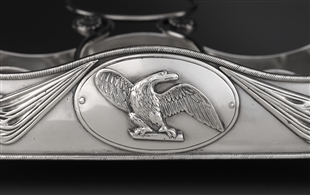 It contains three replacement crystal inkwells and is adorned on both sides by swags and eagles. The feet of the tray take the form of fasces with snakes winding around them, classical symbols of unity and wisdom, respectively.